Annapolis Landscape Architects provides full-service landscape architectural services to clients in the mid-Atlantic region, with a focus on design inspired by the natural systems of the Chesapeake Bay environs. They are a women-owned firm with a contemporary focus and established proficiency. Their team is eager to take on large and small projects with site challenges at a variety of scales. ALA believe that landscape architecture is about building relationships with clients and maximizing the potential of the land and program of work. They assist you in locating qualified contractors that will continue the ethic of team collaboration and project efficiency. They encourage you to explore they work and look forward to assisting you with your next project. Designer of the Week: The Sharper Cut, Inc. The Sharper Cut, Inc. are a full service landscape design and build company in Upper Marlboro, MD. They can help you through every stage of your outdoor project – from initial brainstorming, to design and material selection, and of course final build and installation. They like to begin relationships with their clients by inviting them to their resource room to develop a landscape design for their property. They involve the client through every step. The owners of the company are brothers: Bill runs the design side while Justin runs the production side. They keep all jobs in house with their crews and can design and build anything and everything outdoors, from a townhouse back yard retreat to a full estate plan. Our friends over at BackyardBoss.com wanted to share with you some great tips for pruning in order to keep that curb appeal at its finest. You can click the image above to be redirected to their great post which is divided seasonally, so just scroll down to winter and either get your pruning shears out or call you local landscaper for help. Just remember to watch out for poison ivy and poison oak as this time of year thier leaves tend to turn beautiful fall shades of fiery reds and oranges. And if they have lost their leaves, the roots and vines are just as toxic- trust me, I'm speaking from very recent experience! Always wear impermeable gloves tucked into long sleeves when you're not perfectly sure of what you're handling. Manicure it like it's a country club. According to Inman.com, "landscaping can add as much as 28 percent to the value of a home in addition to cutting the time a home spends on the market by 10 to 15 percent." And the internet is chock full of statistics like this. But also bear in mind that you don't want to put more than 20-30% of your property value into landscaping. Stats also show that people who spend more than 30% actually lose in the long run. Next week we'll take a look at some other exterior fixes to increase curb appeal and talk about the stats that support them. I find it so enjoyable to look at before and after photos of exteriors. It's amazing what some paint, a little landscaping and an American flag can do for curb appeal. The house on the left did a fair amount of landscaping- so much so that adirondack chairs and an umbrella in the driveway actually looks like a very appealing place to sit and relax. The house on the right added paint, window boxes and some minor landscaping yet it looks like a completely different property! Enjoy some more photos of before and afters below- if these don't inspire you to get your curb looking classy, then it must be perfect already! South Fork Studio Landscape Architecture is dedicated to creating inviting, innovative and environmentally sustainable human spaces and native landscapes throughout the Mid-Atlantic region. Their mission is to create and nurture a direct connection between the landscape and the people that inhabit it. Whether designing a small intimate garden room, or a commercial development, their philosophy is to focus on how the needs of the people are best served by the landscape, and how the landscape can be maintained as a self sustaining and functioning ecosystem. Through constant innovation, they incorporate aspects of sustainable storm water management into all projects regardless of size by using techniques such as bio-retention and infiltration. They understand and balance the complex relationships that exist between the engineering involved to create human spaces and the environmental sensitivity that is expected in all great landscapes. Their principal designers create landscapes that are bold yet simple, with connections to architectural styles, and influences from historical and cultural precedents. They strive to provide a memorable landscape experience that requires minimal seasonal maintenance. Call 410.778.1098 or click the image above to learn more. When it comes to your curb looking classy, I can't stress enough the importance of a well manicured lawn. This photo above was obviously take in the spring before the Crape Myrtle came into bloom, but that's okay because at least it has been trimmed back and shows upkeep. The beds are freshly mulched and edged, and the shrubs are neatly trimmed. All these little details come together to both present the property well and send a message to buyers that this property has been maintained. Because if the outside doesn't appear to be maintained then the inside has probably fallen to the wayside as well, and then where is the desire to see more? Keeping with the fall theme, I just wanted to share some pretty decorating inspiration that makes a curb that much classier. I love all the colors that pumpkins and gourds come in these days, and bittersweet is one of my favorites for wreathes and tablescapes. These pictures make me want to break out the wool sweaters, drink cider and smell the fall air. I love the pumpkins in the window boxes! Lighting is a crucial part of being sure your exterior is appealing, both to a buyer driving up and a buyer looking at photos online. 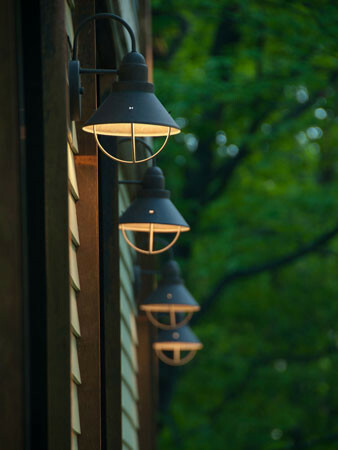 It doesn't matter what kind of lighting you go for, but it is important to have strategically placed lighting in order to enhance your house at night with light and during the day with detailed fixtures. There are many places lighting can go and types of lighting out there. This image is a perfect example of a classic look with both an overhead chandelier and sconces on either side to add symmetry to these french front doors. One of my favorite things about landscape lighting is creating a magical, dramatic effect by lighting the foliage. Whether using large lanterns such as the ones above or small spot lights which are flush with the ground, the impact can be well worth the installment. It creates an incredibly welcoming atmosphere to any home. Finally, pull it all together but being sure your exterior is lit well enough to show your house's expressions. Direct overhead lighting onto windows (not in them!) and keep things as symmetrical as possible even if you may only have room for one sconce. If you click the image above it will link you to some very useful tips as to how to go about planning your lighting out. As long as you constantly keep in mind that you want to show of your house's best features, the rest should come easily. If there is one thing that has potential buyers wanting to see more, it's curb appeal. Whether your house has been on the market for some time and isn't getting much traffic, or you're just thinking about getting it ready to sell, the first thing you want to consider is the exterior. The fact is, people judge houses by their cover because the cover has a lot to tell. Each Monday we will be offering gardening, landscaping and lighting tips, look at popular colors and styles for siding, windows and doors, and most importantly learn what is eye-catching for potential buys. This week we are starting with just a few simple tips to get you started. Click any image for its origin. 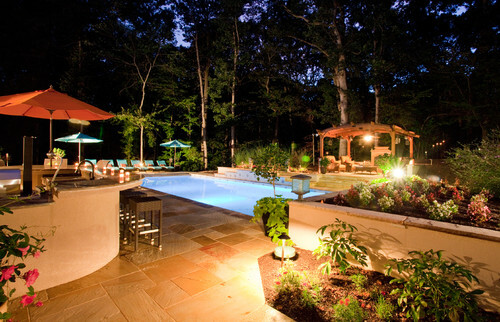 For over 30 years, Stewart Lawn & Landscape of Annapolis has designed and maintained outdoor living spaces in Anne Arundel County. They will create a seamless transition from the lawn and garden, to the walkways and landings, to the patios and decks. The end result is a great outdoor living experience. Early spring flowers are the surest sign that warmer weather is coming. Our list of early spring flowers will give you ideas for the best flowers to plant in spring. After a long winter, it's time for spring landscaping! Many of their uninformed clientele believe that Homestead Gardens Landscaping only works with plantings, but that couldn’t be farther from the truth. They are proud to employ some of the best masons in the area, and their quality craftsmanship is of a caliber that provides Homestead Gardens Landscaping with its reputation. Whether you want natural stone walkways such as flagstone and blue stone or the look that man-made concrete pavers offer; their masons make special note of all grades around the area and lay the materials in the proper footer designed to make the area stable for a lifetime. ​Click on the image for more information. Richard is a Licensed Landscape Architect and brings 15 years of design experience to Walnut Hill. Richard has gained considerable experience with his extensive work on award-winning residential projects throughout the Chesapeake Region. He holds a Bachelors Degree in Landscape Architecture from West Virginia University where he received awards of design recognition and led his class in academic excellence. When it comes to design, Richard is proud to employ a unique and dynamic approach, which provides Clients with a comprehensive design process that is a collaborative effort between him, the Client, the architects, the engineers as well as other design professionals. Richard creates outdoor spaces with fluid transitions through the use of extensive design, material, plant and construction knowledge. Ultimately, this philosophy provides his Clients with functional outdoor spaces that are uniquely appropriate for their environment, reflect their personal tastes, while maintaining consistency of the property’s architectural style. Through international travels Richard has gained design inspiration which he applies to the design process. Perhaps the most romantic pool is one that seems to spill off into the horizon, out into the sea. What could be more delightful than to float in a pool where the edge seems to slip right into the Chesapeake Bay? This waterfront home situated at the mouth of the Magothy River overlooks the Baltimore Lighthouse and beyond. Sailing ships pass by. Beneath the shade of white pine and magnolia trees is a pool deck for lounging and taking turns diving into the deep end. Click on the image above to read the full article and for more photos. For seven decades, the Four Rivers Garden Club (FRGC) has held its May Mart, offering Annapolitans a glorious selection of flowers, herbs, plants and, of course, May Day baskets. May Day is Friday, May 1st from 8am to 2pm just outside the doors of the Market House in Downtown Annapolis. Check out these beautiful front and backyards and get ideas for your own outdoor space. Why You Should Plant It: They’re survirors that laugh in the face of drought and deer. They love hot, sunny climes and bloom in summer when most trees have ended their show. However, crape myrtles don’t love to be topped off; if you give them plenty of room to grow, you can use a lighter pruning touch. September should bring relief to gardens in the Northern Hemisphere and signal the start of a new season for gardeners in areas that have been too warm for anything but hothouse tropicals, as well as southern hemisphere gardeners. So whether you are beginning the process of putting your garden to bed or gearing up for a fresh start, September can be one of the busiest months in the garden. Let's just hope the weather cooperates. Alstroemeria (Peruvian lily)Flowers of the evergreen hybrids come in shades of purple with dark flecks and last well in bouquets. Alstroemeria aurea blooms come in shades of yellow and orange. The 2-to 3-foot tall plants produce flowering shoots as long as the soil doesn’t get too hot. Twist the shoot off at the base to keep them coming. This stone-walled pond holds fish, lily pads and a small waterfall. Getting the farm-fresh taste of homegrown produce just got a little easier. Organic farmers use sophisticated growing methods, so why should your backyard garden be any different? With a little effort and mindfulness, you, too, can raise beautiful fruits and vegetables that benefit the environment and your health — not destroy them. We’ve collected a few new-to-market items to get you started on your own farm-to-table experience. These ideas will help you from the moment you plant your seedlings to months later when you spread loamy soil from the composter for the next season’s harvest. Not even good taste, it might seem, can rescue certain tools for the sophisticated gardener. Plastic pots. Impatiens. Perhaps, above all, the lowly marigold. It can appear fake — splashy and eager to please, with nothing to say — until you get a snoot full of its garbagey spice smell. Certainly anyone who studied garden design in the last 50 years learned to avoid the marigold like the plague. It was considered too easy to grow, too common. Something to stick in a gas-station island in a mindless effort to enhance curb appeal.